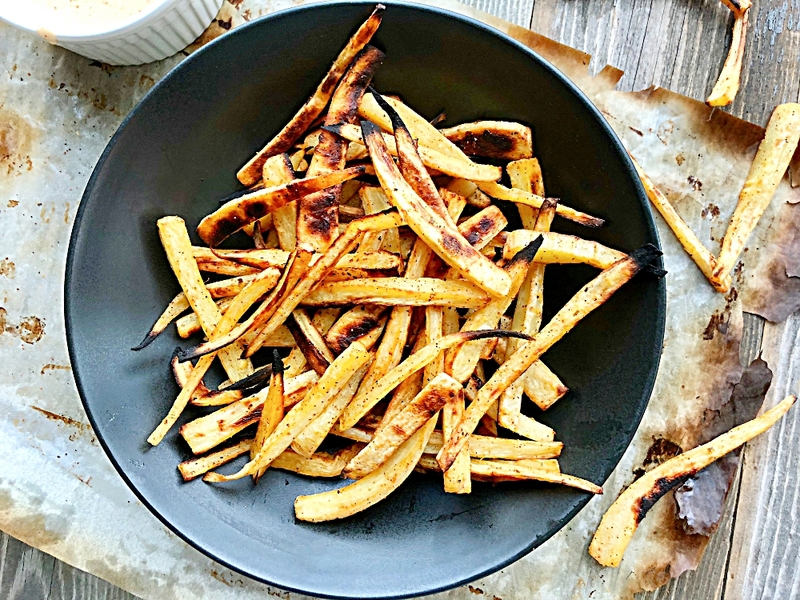 These 4 ingredient salty crispy Parsnip Fries are so satisfying, surprisingly even to my husband who doesn’t like parsnips. We’ve been on the move and I have too often found myself in a strange kitchen, without my normal tools and well stocked pantry. Having a kitchen when we travel is a must but I’ve learned I can’t depend on guest kitchens having these 2 things that are must have’s. They are a cutting board and a good veggie cutting knife. So to answer your question, yes I travel with those. Along with a portion of sea salt, garlic powder, and this homemade taco seasoning. 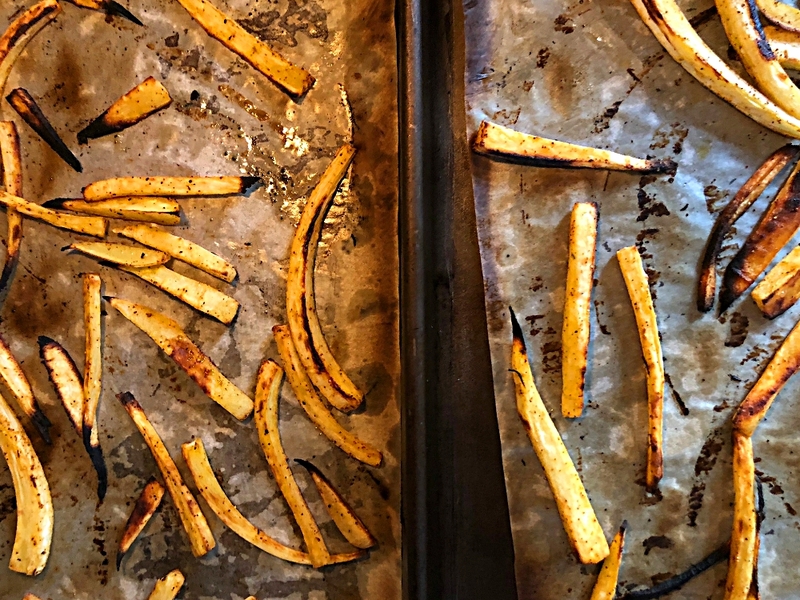 Wandering through the local Trader Joe’s, I was craving french fries and thinking how can I get those fried salty goodies in my mouth (but wait, I have a potato intolerance) and then at that moment I had a revelation. 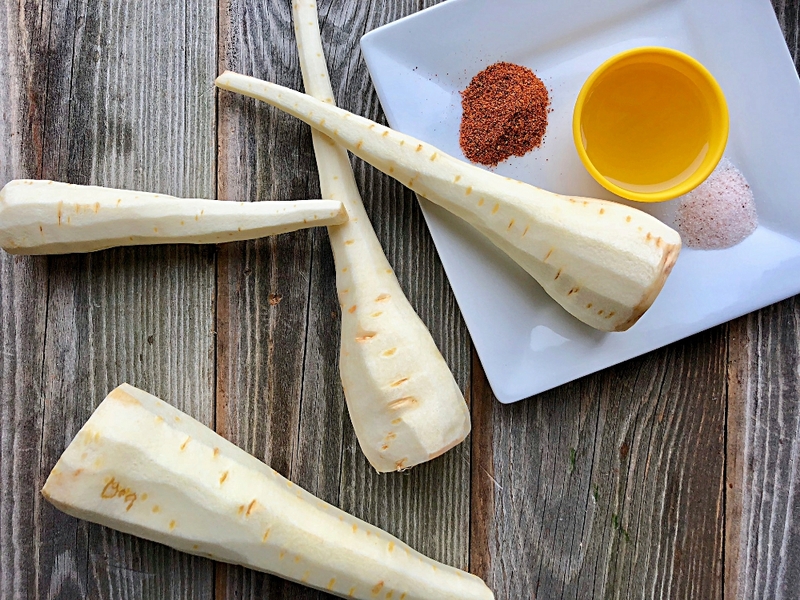 So I scooped up some parsnips and went back to our Airbnb and made these. And the hubs raved. I’ve made them a few times since because I dream about them. It’s true. All you need is parsnips, avocado oil, sea salt and taco seasoning but the taco seasoning is totally optional. These are great with just sea salt. To achieve crispness, you’ll want to cut them in 1/4 inch pieces as best you can. First, cut the parsnips in half. Then slice the larger halves in 1/4 inch slabs. Then cut slabs in 1/4 inch sticks. Do your best to cut the skinny bottom halves into 1/4 inch sticks too. After they’re all seasoned, spread them evenly on 2 prepared baking sheets. Pop them into a preheated 450 degree oven. Yes, that hot! Half way through roasting switch pans from top to bottom and bottom to top. Before serving place each pan under the broiler to crisp them up some more. Sprinkle with extra sea salt and serve hot. 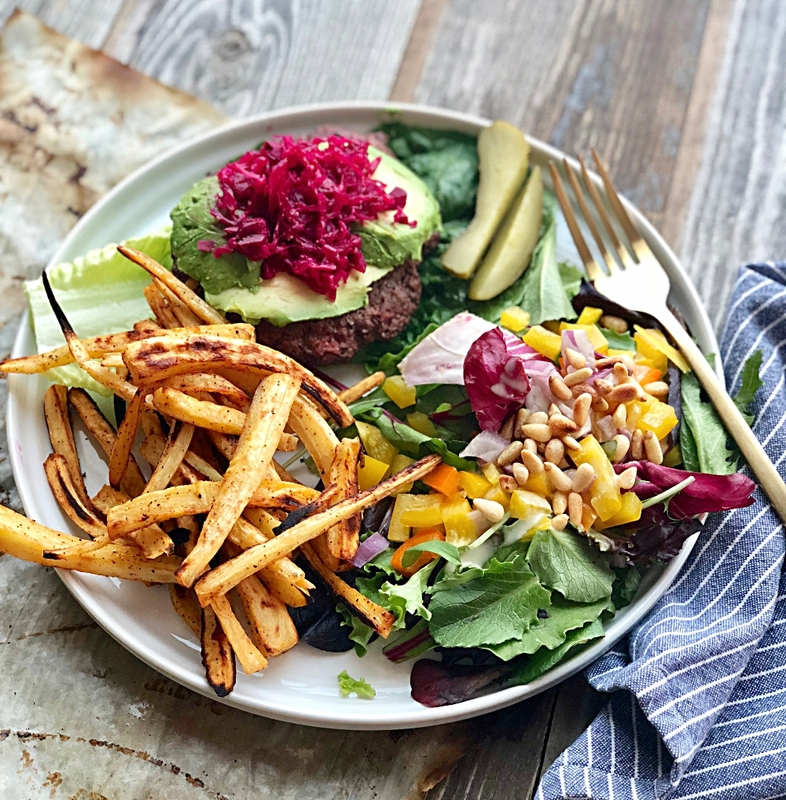 Paleo, vegan and keto friendly, these are so easy and delicious. Serve with your favorite burger or any grilled protein. I hope you love these like we do! Arrange 2 oven racks in the center of your oven. Preheat oven to 450 degrees. Line 2 baking sheets with parchment paper. 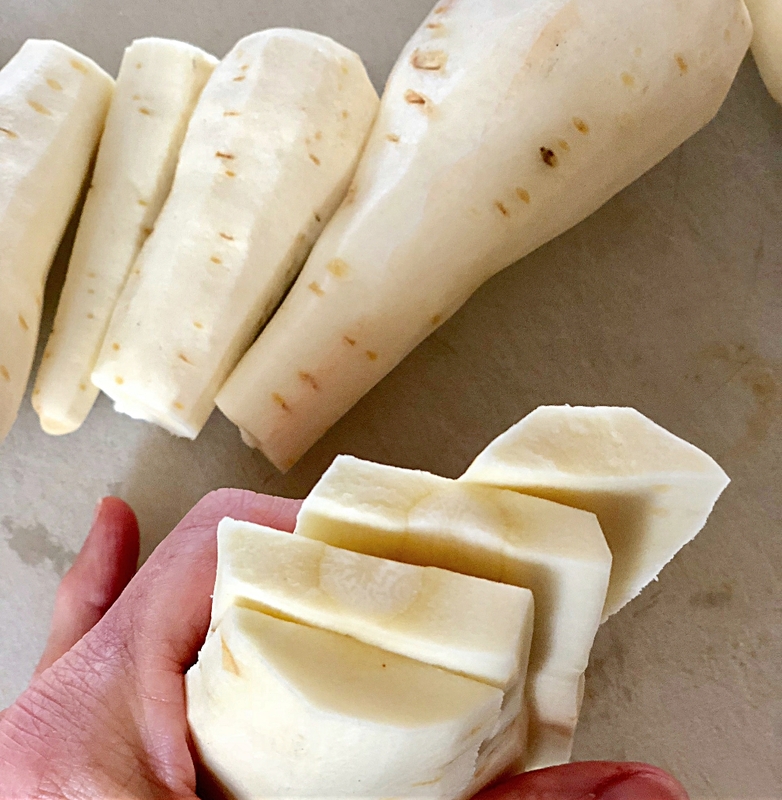 Cut parsnips in half cross ways. Slice the thinner bottom half into 1/4 inch pieces as best you can. 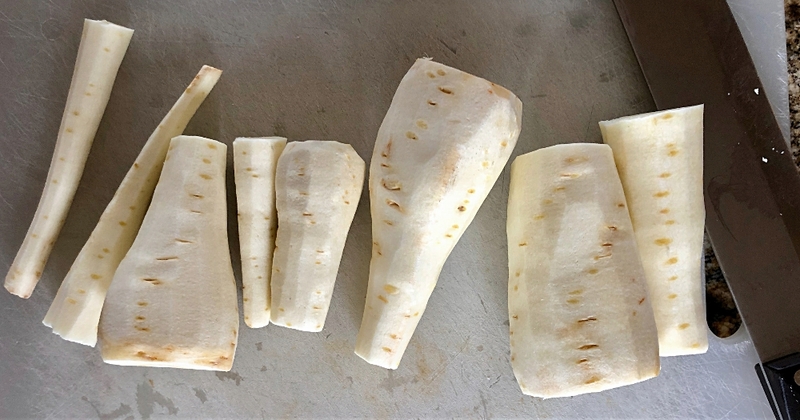 For cutting the top half, slice a thin piece off of the top of the parsnip to create a flat surface. Place flat surface on the cutting board standing the vegetable upright. Slice 4, 1/4 inch slabs through the top halves. Lie flat slabs down on cutting board and do your best to slice them into 1/4 inch pieces. They won’t be consistent because of obvious reasons, but the smaller pieces are more crispy so shoot for that. 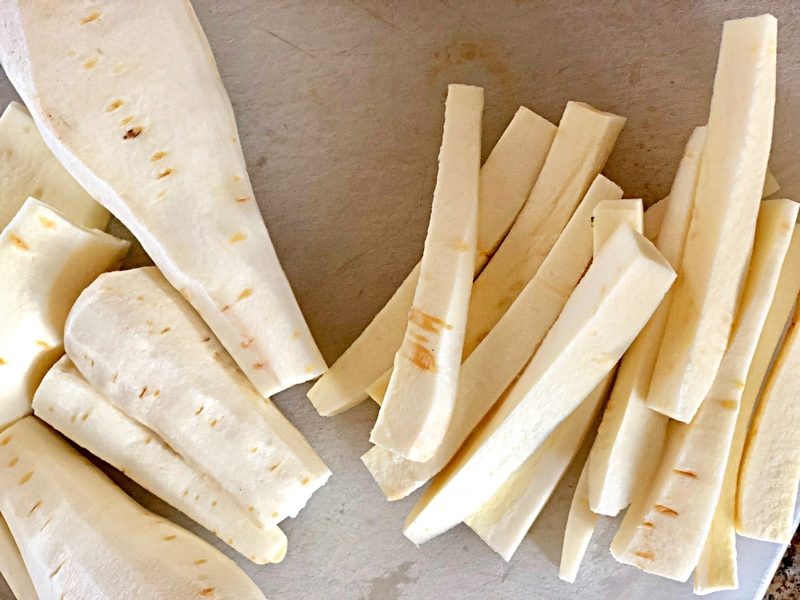 In a large bowl, toss parsnip pieces with oil to coat. Toss in sea salt and taco seasoning, if using. Mix well to ensure even coating. Divide equally on two prepared pans, in a single layer. Place in a 450 degree oven on each rack centered in the oven. Set timer for 10 minutes then switch racks putting top pan on bottom rack and bottom pan on top rack. Set timer for 10 more minutes. Remove pans and set on a cooling rack. Move an oven rack to the top position in oven. Turn broiler on high heat. 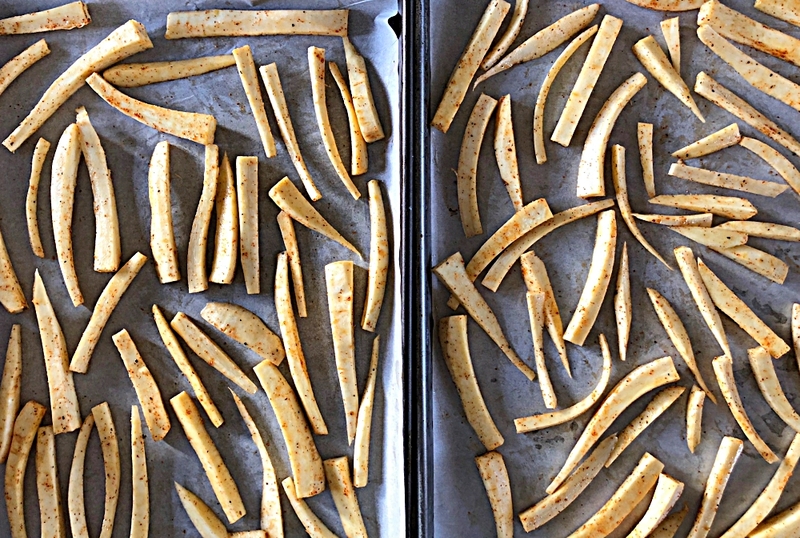 Take turns putting each pan under the broiler to crisp up fries for 2-3 minutes each. Sprinkle with extra salt if needed and serve while hot.